Pizza! A regular treat for most North Americans, whether by the slice at the authentic Italian place or delivered from the mega chain outlet. Peter Reinhart gives us, for bread number 25 in The Bread Baker’s Apprentice Challenge, his version of Pizza Napoletana which he describes as a thin crust with, preferably less ingredients so that the bread experience is not overwhelmed by gargantuous amounts of toppings. “Keep it simple” is the motto here. A simple sauce, two or three cheeses, maybe a little pesto smeared on the dough or perhaps a white sauce and some fine herbs, crowned with one or two high quality toppings and you’re good to go. Our standard Pizza Night order is tomato sauce, cheese (some mid-quality commercial mozzarella is what they put on), mushrooms, black olives (or sometimes onions) finishing with pepperoni (right half) and Italian sausage (left half). We deviate a little now and again but this is our “usual”. So I figure for this home-made pizza I’d do a little switch-up and try something new. But before we can get to that part, of course, we need to prepare the dough for the pizza shell. Since this dough is noted as best chilled overnight, I have time to get to the store tomorrow and see what ingredients might inspire for toppings. The ingredient list here is really basic. We have flour, instant yeast, salt and ice cold water. Peter suggests using either high gluten flour or bread flour, adding some olive oil to make the dough easier to handle or using unbleached all purpose, recommending that you try both ways and see which one you like better. So today I went with UAP. I also reduced the amounts so that I’d get four 12″ pizzas instead of the six shells the recipe makes. The process is very straight forward and easy to follow. Place all ingredients into a bowl (no oil here since I didn’t use bread flour) and mix until all water is absorbed. Switch from paddle to dough hook and knead for 5 – 7 minutes until the dough is smooth and sticky. The dough in the bowl wasn’t behaving correctly and seemed a bit dry – the bottom is supposed to stick while the sides clear so I added about 2 teaspoons of ice water as it was getting kneaded. Once the dough was ready, it was turned out onto a floured counter – this was definitely sticky dough – and the ball divided into (my four) pieces. I weighed the ball and the pieces came out to about 170g each. Sprinkling a bit of flour on the pieces to keep them from sticking to my hands, they were shaped into balls then placed on a baking sheet with parchment that was sprayed with spray oil. The dough was then sprayed as well and I topped it with plastic wrap. Lastly, it went into the refrigerator to rest until tomorrow’s cooking. So far, this has not been a difficult dough to make at all. Even if I was doing it all by hand, it’s still very simple and easy to do. I figure I’ll make two pizzas tomorrow, freezing the remaining two balls for use another day. So now I’m off to go search for interesting pizza topping ideas. I’ll have to pass on the pesto as we’ll be dealing with clients the next morning and we don’t want heavy garlic breath… I’ll save that for a pizza night that falls on a weekend. See you back here tomorrow! Next day I pull the dough balls out of the refrigerator and let them warm for two hours. Then comes the stretching part. Needless to say, I’m using both hands at this point so I don’t have any photos of the process. Let me describe it as… awkward. I’m sure someone who’s made thin-crust pizzas before would be able to pump these out in mere seconds and have them look fine. Not me. Not on the first try at least. The gyst of the process is that you take the dough ball and gently stretch the edge using the back of your hands and mostly your knuckles, under the dough as it gets to be a larger and thinner circle. Pizza number one didn’t fare too well, there were lots of holes happening. A little pulling and sticking back made them pretty much all disappear. So that one didn’t look too good. On to pizza number two. Same deal, stretch from below using the back of the hands, well floured by the way, this is still very sticky dough. Having one whole pizza shell under my belt (figuratively) I was able to pull this one (!) off a little better. This one I have a photo of. OK, its not exactly “round” bit I didn’t really want it a perfect circle as it was going onto a square stone in the oven. Next came the toppings. The crusts were given a thin coating of tomato sauce (made from tomato paste, finely chopped garlic and some dried mixed herbs, although it could have done with a teaspoon or three of water) then very thinly sliced mushrooms, onions and fresh basil and parsley as well as some fresh grated parmesan and cut up mozzarella cheese. 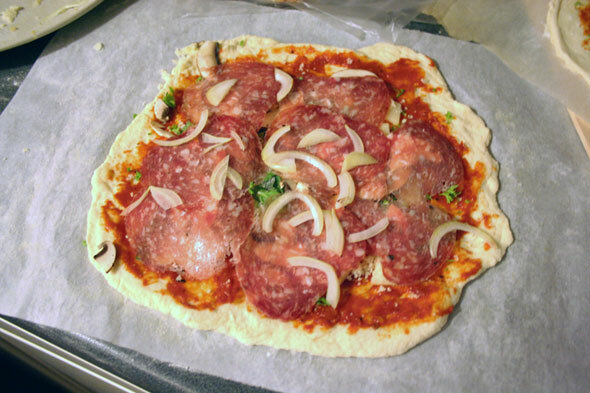 Lastly, one pizza got shaved prosciutto and the other genoa salami. Into the well preheated 520º oven with stones for about 7 minutes. There were, fortunately, no oven mishaps. The pies were on parchment and slid off the peel and onto the stones easily. Once the crust started to show a nice baked colour and the cheese melted and began bubbling, I took them out so not sure precisely how long they were in. But here’s the final shot before they landed on the table along with a glass of red wine and some Caesar salad. Now I’m not sure how this compares to “real” Napoletana pizza since we don’t ever order thin crust or “Napoletana” style pizza. This was a first. So as a total n00b to this sort of pizza, I quite liked the results, although I can’t say for certain if it’s because of the bread or the toppings. I liked the cracker-thin aspect, although the salami one (which got holey and overhandled ) seemed a bit tough. 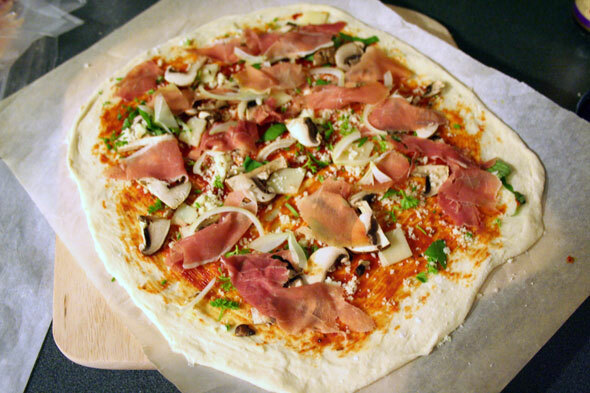 The prosciutto pizza which got the second crust seemed a bit crispier, less tough. Flavour wise both were nice. But since the bread itself is soooo thin, a very large part of the total flavour came from what was on top, even though it wasn’t “loaded”. All in all, they were OK. Since I still have two more dough balls in the freezer, I will give it another try and maybe next time I’ll use some white sauce so the bread flavour comes out more. Overall, though, this was good. A nice change from “the usual”. Not as filling however, so this really needs side dishes. And here, just for fun, is a clip of Italian celebrity chef Gino D’Acampo showing how easy it is on the ITV1’s Daily Cooks in the UK. The pizza I had in Naples was, if anything, more sparse than that but most definitely leaning in that direction—ultra-thin crust healthy toppings. I actually can’t remember ever seeing cheese on Italian pizza but that doesn’t mean they never use it. I do remember that they use olive oil nearly everywhere that we use other kinds of oil and in many cases (not baking of course) where we would use butter. The first time I had my breakfast with eggs easy over and they were prepared with olive oil it took me aback but they were actually great. 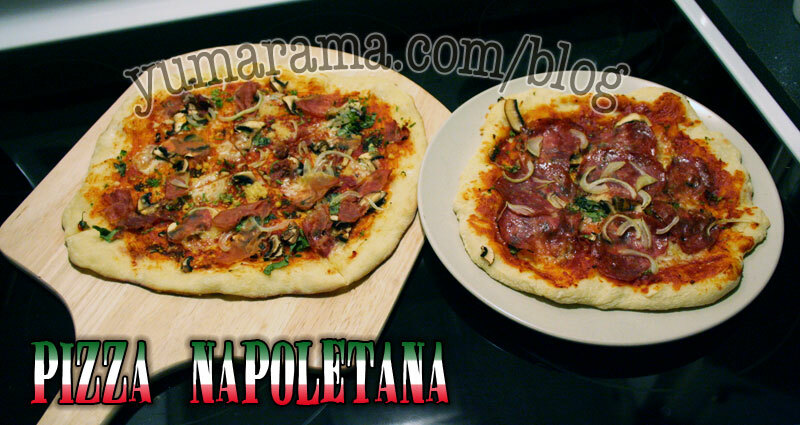 Thanks for the comment, I know I strayed from the typical simplicity of Napoletana but I had to ‘sell’ this to the BF and he has certain expetations. Had it been simpler, it probably wouldn’t have been so well received. As it is, it wasn’t crowned the best pizza. A little too thin and too crisp, I’m told. But we’ll do it again and eventually, I think I’ll be able to trim it back down. Your pizzas look wonderful. You were very smart to use parchment!! To say the handling of this dough is a bit tricky is an understatement!! I had a bit of a disaster with this one. Nice pies there! I used high-gluten flour and the stretchiness was amazing. I also loved the flavor of this recipe. Good Idea to use parchment. I should have because one of my pies toppled over onto the baking stone when I hesitated. I dunno why I grabbed the AP flour first, I shoulda used my Dover Unbleached Bread (it’s 14%). Oh well. I still have two pies’ worth in the freezer so it’ll be a bit before I get to a new batch. I was gonna do the dough on the floured peel but even just with that it was sticking like crazy so I went ahead and pulled out some parchment, made thing oh so much easier. I’ve also found loose flour or cornmeal on a burning hot stone or stove bottom to set the fire alarm a beepin’. Wow, your pizzas do look great. I’d like to have a piece ;o). Mine turned out fine, even though I think I need a little more practice. Previous PostPrevious Why Discard Starter: A Mathematical View.